Your windshield is the number one safety restraint in your vehicle, and an improperly installed windshield or cracked windshield increases the risk of an auto accident. Here are a few tips when you’re looking for windshield replacement for your vehicle in the Reno area. Windshield repair or windshield replacement? Here’s what you need to know. You know that crack in your windshield you have been sporting for a few months. You may have taken some steps of your own to make sure the crack in the glass did not get any bigger, but how do you know when it is time to seek expert help? The factors to consider before choosing windshield replacement involve the extent of the damage to the windshield. How large is the crack? Is it a small chip, or is there depth to the crack as well? Are you driving in a climate like Reno where the weather can actually make the damage worse? These are a few of the questions you should ask yourself or an auto repair mechanic when deciding if you need a windshield replacement. One of the biggest issues arrives when a crack in the windshield obstructs the driver’s view. If any damage to your windshield is making it difficult to see when driving, it is time for windshield repair or replacement. 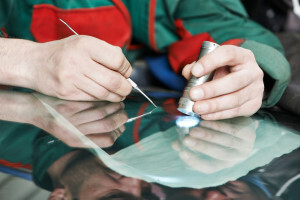 If you are not sure if the damage to your windshield merits repair or replacement, consult experts at an auto body shop. They can assess the damage to your windshield and tell you if it can be repaired or if it needs to be replaced. If your windshield on your vehicle has just an insignificant crack or two here and there, you may be able to repair your windshield cheaply at an auto repair shop or even on your own at your Reno home. If you want to repair your own windshield, you will need to purchase a kit that includes resin to inject into the windshield crack of your vehicle. There are some downsides of attempting to repair a windshield on your own. A DIY Repair Kit cannot tell you if you actually need a windshield replacement instead of repair. Windshield repair do-it-yourself kits also take hours out of your day, while an auto repair shop can repair or replace your windshield professionally and efficiently. Need windshield replacement in Reno? Liberty Collision can help! Liberty Collision is your ally for a local auto repair shop in the Reno community. Donnie Thiessens of Liberty Collision has been a resident of Reno, Nevada for over 50 years, so he knows how the Reno climate can affect your car and even exacerbate damage after an auto accident. With over 25 years experience in collision repair and restoration, the team at Liberty Collision can return your vehicle to pre-accident condition. From towing to handing you the keys, we can take care of you and your car at any phase after an auto accident. At Liberty Collision, we care about not only the cars but also the people who drive them. Contact us today so we can help you with your auto repair needs!